Working in a prestigious office seems like a dream come true but dealing with a bossy coworker may set you for a big headache. Tolerating these kinds of people seems difficult, sometimes it even works against you in office. These kinds of people know no limit and do anything to irritate the hell out of their co-workers. It often happens that people don’t know how to deal with this kind of people in the workplace and succumb to their wishes which harm their career in the long run, even in few cases situation go out of hand and become intolerable for the good workers. 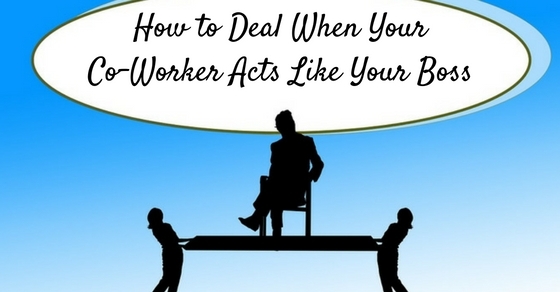 The big question is how to deal with co-worker acting like a boss in your workplace? To deal with the bossy co-worker you need to use your patience, smartness and attitude in the right direction. Don’t do something which may cause problems for you to deal in the office with other colleagues as well as higher authorities. The first step in dealing with a bossy co-worker is to identify them first. To identify bossy co-worker use these simple steps. 1. Does your co-worker trust you? The very first thing you must know when you analyze your co-worker is that they trust you? It happens sometimes that due to your previous work or lack of deadline meeting in last assignment of your work , your co-workers start to mistrust you and dim you unfit for the job. If that is the case then prove you are worthy of working on your own without confronting your co-workers. Trust is what makes your co-worker stand back and not to interrupt you in your work. 2. Do they take your decision? When you check to know if your co-workers are bossy or not, check if they take your decisions? If your co-worker tries to take all your decision or take a decision without consulting you then your co-worker is bossy. Your decisions are you to take and no one can do that other than your boss. 3. Do they interrupt you at every point? To know if your co-worker is bossy or not, check if they interrupt you all the time in your work hours or you are just assuming by your own perceptions. Some people like to interrupt in other’s business even without knowing that they are crossing limits by doing so and some do it on purpose to distract you. Make sure what your co-worker doing is bossing you around, not just friendly nature of conversing at every given opportunity. 4. Do they insist on making change even before seniors check them? If your co-worker tries to manipulate you into making changes in your file or presentation and insists on making changes on their own without superior consultant then your co-workers are bossing you around. Check your co-worker’s behaviour to know what they are trying to do. 5. Do they make you feel like a child in your own workplace? Do you feel like a child when conversing with your co-worker? Or they belittle you at every given opportunity? If this is the case then its alert, your coworker is trying to boss you around by intimidating you or by making you feel like you are not fit for the job. It can be their tactics to take your place and project in the office by making you question your own confidence level and decision-making power. 6. Do they pay more attention to you than their own work? Some people think so highly of themselves that others are an idiot for them which cause them to pay attention more on others work than their own. This kind of people love to boss around and do not want any suggestions and ideas, they just love to show they are more intelligent. After finding if your coworkers are bossy or not it comes to how to deal with them? To deal with your co-worker use these simple steps so that you can avoid such kind of colleagues without creating a messy situation. If you know that your co-workers are trying to boss you around or someone particular doing it then stay alert and wary of them. Just don’t give them any chance to boss you around and avoid any situation which gives them opportunity to boss you around. Diffuse any situation which creates an opportunity for others to boss around. Standing up for your own self is what most people need to deal bossy co-worker. Some people bend on slightest pressure from other, this gives the wrong indication to others and they use this opportunity to boss you around. Stand for your own self, put down initial efforts of bossing you around and handle the situation before it goes out of your hand. If you give them a finger they will try to sit on your shoulder. This happens when you give space to others and they use it to be your boss. Avoid giving them space so that they cannot boss you around, don’t leave anything for them to use against you and do your work according to the instructions from your manager. There is nothing you can do if you fight them when your co-worker bosses you around. Fighting back will create a scene in the office and it will look bad on your part. It may cause you mental stress but fighting is not the way how you deal with these kinds of people, they will use it against you and will fit you unworthy of your position. When it comes to a co-worker who behaves like your boss humor is the way to keep them at an arms distance. When you say something in a way that it look like you are saying something funny, it will cause less stress in your relationship with your colleagues and they will know that you can handle your work very well. Warn them with a smile on your face but say your words firmly so that they can understand what you’re saying without causing drama. Sometimes we didn’t see the hidden suggestion in our co-worker bossy attitude which might help us to improve. When your co-worker boss you and give instruction to do something the way they are saying just listen carefully but do not react, take their suggestion seriously and think if it can help you if not then discard the idea and person but if the suggestion is good to take it but decide everything yourself. Don’t let your co-worker know about their suggestion acceptance it will stroke their ego. If your bossy co-worker doesn’t take the hint to stay away then have a private talk with them. Talking in a public place may create a scene and get unwanted attention from your colleagues which will do no good for you. Take your bossy co-worker for a tea break or lunch outside and have a conversation about their bossy attitude and tell that you are well capable of your job that’s why you are appointed for the job. The private conversation gives you space and time to say what you feel without causing a scene in your workplace. Setting necessary boundaries is important for your workplace and co-worker. When you let anyone interrupt you in your work people start to boss you around. You are here to work so only work and set boundaries for others and for yourself so that they know to keep their own business. Sometimes it becomes necessary to let other knows that you are here to work and no one can tell you how to do something other than the boss. Setting boundaries also help in improving your work as well. If your bossy co-worker doesn’t understand the right way then involve your supervisor, boss or manager. Make your statement clear in front of your boss and ask for clarification on your work, what you will do in front of your bossy co-worker that way they will know that you will not scum to their way just because of your attitude. Involving superiors may go against you if you have bad work reputation in your workplace so improve yourself first and use above suggestion to ward off your bossy co-worker. Keep it for last and only involve your boss when you feel like situations are out of your hand and you cannot handle it on your own. If your bossy co-worker doesn’t know the limit where to stop then inform your HR department and higher authorities in your workplace. Try to solve the problem on your own but if the condition is out of control then involving higher authorities is the only solution but be ready to prove your point because bossy co-worker generally knows how to prove their innocence. After learning what to do to deal with a bossy co-worker it’s time to know what not to do when dealing with a bossy co-worker so that you can avoid something terrible before it happens, Use these steps to know. Arguing is not the permanent solution and it gives space for others to talk. Never show how affected you are by arguing on the spot, this is not the way how professionals deal with the situation. Use your mind not your tongue to solve the problem. The creating scene on your workplace is like being your own enemy, it will present you like someone who doesn’t listen and fight for a small thing. The creating scene will never solve your problem even it gives a chance to your bossy co-worker to prove how incompetent you are to handle your work when you can’t handle your own temper. Talking behind their back will never do any good for you especially in the case of your bossy co-worker. It will present you in the wrong way in your workplace and chances are someone does the same for you. This is the bad habit and causes so many problems to deal with. Deal with your bossy co-worker in a way that solves the problem without leaving a stain on your image. Your bossy co-worker may provoke to take their every suggestion but listen only and take your own decision. Sometimes to keep them away we take their every suggestion but using your own mind is far better than listing others especially when you have a bossy co-worker to deal with. Spoiling image of your bossy co-worker will do no good for you. Spoiling their image is like throwing a stone into a mud pit, you are going to stain yourself as well. Solve matters like an adult and responsible employee. After discussing how to deal with the co-worker who bosses you around we can only say that dealing with a bossy co-worker is a tricky situation. One wrong move on your part may present you in the wrong way. This is the matter which needs to be solved without creating scene and drama in your workplace. Use above suggestions to deal with a bossy co-worker and improve your own working standard as poor working standard gives the opportunity for others to boss you around. Do not involve yourself in activities which are not related to your work as well as maintain deadlines and complete your task within time, that way your bossy co-worker will not boss you around. We hope this article will help you in dealing with a bossy co-worker in your workplace.